Aligning Six Sigma objectives with organizational goals. Contingency and business continuity planning. Common causes of Six Sigma failure. 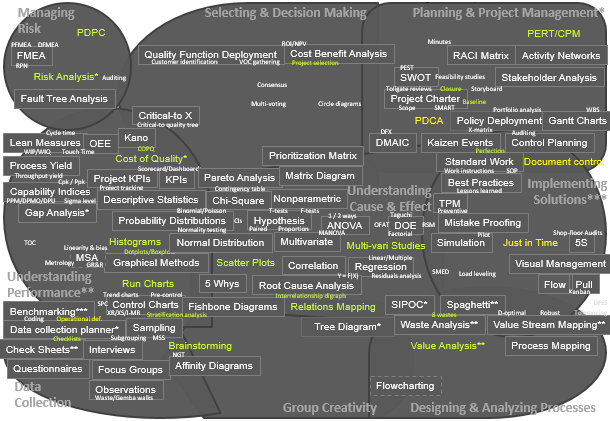 Six Sigma impact on stakeholders. Hard cost measures and soft cost benefits. Elements necessary for successful teams. Measurement systems across the organization. Population parameters and sample statistics. Process capability for attribute data and non-normal data. Tests of means, variances and proportions. Evaluate results to select the optimum solution. Training for process owners and staff. Ongoing evaluation of the improved process and continuing process measurement. For more information about how to prepare for the exam and how to apply for the certification, visit the official Black Belt webpage on the American Society for Quality website.